An evangelist with Jeremiah Cry Ministries is leading a 10-week ‘Cross Canada Tour’ to spread the good news of Jesus Christ throughout the country. 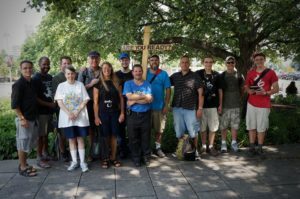 Chris Sippley of New Brunswick, Canada, who conducts evangelistic outreach locally and throughout the United States, says that this is his first full tour of the nation. Sippley preaches in the open air to passersby. Sippley is traveling cross-country with his wife and two young children, as well as a family from his church, Providence Christian Church in New Brunswick. Mike Stockwell and Robert Gray of Cross Country Evangelism have also been along for the trip, and local Christians have likewise joined the team for the day to help distribute Gospel literature or witness one-on-one with passersby. So far, the group has traveled to Moncton, Quebec City, Montreal, Ottawa, Steinbach and Calgary, and plans to continue to head west to Vancouver, Saskatoon, Edmonton and other regions. He said that although there have been those who have rejected the preaching of the Gospel, one of his most favorite memories so far from the tour was when a group of interested youth requested copies of the Bible. 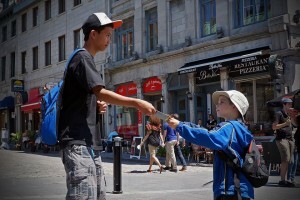 Sippley’s son gives Gospel literature to a teenager on the streets of Quebec. 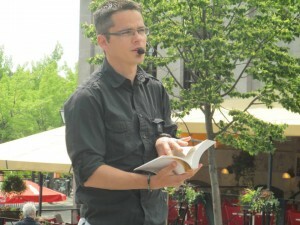 While some may not understand the work of an evangelist, and why men would spend 10 weeks preaching outside of a church, Sippley says that he is compelled by his love for both God and man to see the people of Canada come to the knowledge of the truth. The “Cross Canada” tour will continue throughout the country until August 31st.